We’re happy to announce that JHP Design has been shortlisted at World Retail Awards with Shinsegae Duty Free stores in Incheon International Airport, Seoul! The World Retail Awards is a global platform that recognises and promotes retail excellence. Retailers from all countries of the world and all retail sectors will compete to win these highly coveted awards, covering the key areas of retail skills and operations. The results will be announced on the 16th of May at the World Retail Congress in Amsterdam. Stay tuned for updates! Incheon International Airport is officially the World’s most successful airport with annual sales of US$2.4 billion for 2018. JHP has been involved in the airports commercial success for many years working with the Airport authority, Lotte and Shinsegae Duty Free operators and Food & Beverage brands. Thalia, the largest chain of book stores in the German speaking countries commissioned JHP to reinvent their retail venues. Thalia operates 300 bookshops in Germany, Austria and Switzerland, owns online bookseller Buch.de and is part of the retailer alliance that sells the e-reader Tolino. However, the essence of the stores is their ability to provide personalised stories across all channels, feeding the minds of each and every reader no matter the age or demographic. The stores are equipped with an eventful customer journey which includes reading lounges, kids zone, literature cafés, gifts areas and much more - all focused on the comfort of the individual customer. JHP Design worked closely with Brand Strategist Alex Pesjak from Leistungswandler and Project Manager Katja Winterer from Brand Retail Space. With careful consideration of this individual and personalised approach JHP developed an interactive living store. The company’s possession of its own publishers and printers allowed JHP to integrate experiences such as book signings, poetry readings, storytelling, writing classes, art workshops and digital lectures giving everybody a chance to immerse deep within worlds of their own imagination. 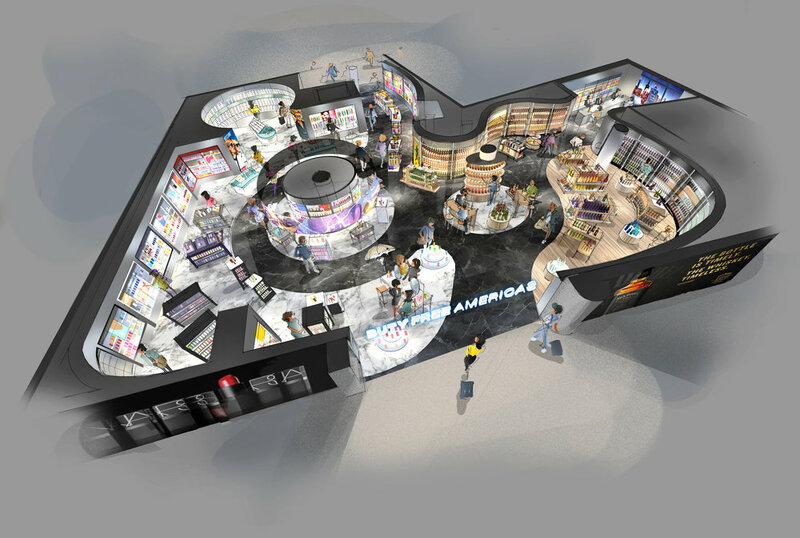 Duty Free of Americas commissioned JHP to develop a new design and retail approach for four of their key sites in Miami International Airport. The Airport’s infrastructure has evolved over time and as a result the commercial outlets in the Terminals are often complex in configuration. JHP’s response has been to develop an amoebic and flexible retail system that can adapt to any environment. The first stores will open in early 2019. Thalia, the largest chain of book stores in the German speaking countries commissioned JHP to reinvent their retail venues. Thalia is vertically integrated owning its own publishers and printers. This provided JHP with a unique opportunity to develop a living store. The stores are complete experiences incorporating book signings, poetry readings, storytelling, writing classes and literature cafes. The first outlet in Hagen will open shortly. HYUNDAI’s first venture into the world of Duty Fee has opened on the top three floors their prestigious Coex site in Seoul. JHP’s design for the store focused on an environmental backdrop of minimal modern luxury enabling all categories to present their brands with clarity and palpable excitement. The greatest ice cream (gelato) in the world comes from Italy and for many the greatest Italian ice cream is GROM. JHP have been working with GROM developing a new flagship concept that fully expresses the brand's variety and provenance all the way back to their own organic farms in the Tuscan countryside. The first flagships will open shortly in Turin and Milan, with their London flagship on Piccadilly open since July. JHP have been working with Rome Airport on the interior design and visual integration of their new East Terminal. We were commissioned to optimise the passenger experience and customer journey of the new airside departure hall, celebrating Rome's eclecticism, history, culture and dynamic future. Long term client Woodlands Market have opened their third store in the Bay area as described here by Owner Don Santa. Located in the heart of the fast developing Tech area of downtown San Francisco, this is a store for those in a hurry. Despite the store’s very different format from its namesakes in Marin and Tiburon it shares their values of Community, Ease and Provenance. We are proud to announce two big wins of projects JHP were intimately involved with, at this year's FAB awards. JHP's Managing Director Steve Collis spoke at this year's FAB conference in Helsinki. Centered around dynamics in F&B airport design, Steve shared things Food and Beverage retailers must own to succeed in today's modern travel hubs. The first Flagships will open shortly in Turin and Milan, with their London flagship on Piccadilly opening at the end of June. Seoul Incheon Terminal 2 has now opened. The home of Korean airways, it is the most advanced Airport Terminal in the world. JHP worked with Shinsegae Duty Free on the commercial and leisure facilities that encourage customers to arrive as early as possible. 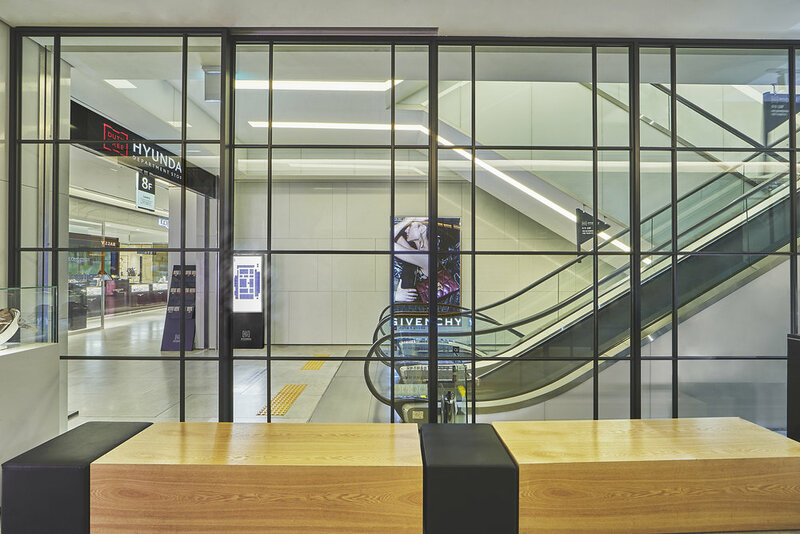 Including accessories, fashion, electronics and toys, Shinsegae Duty Free's luxurious outlets are now open to 18 million passengers throughout the year. Following JHP's long-standing relationship with South Korean Lotte GRS, we were commissioned to design an entirely new premium coffee experience, the 'Garden of Heaven'. 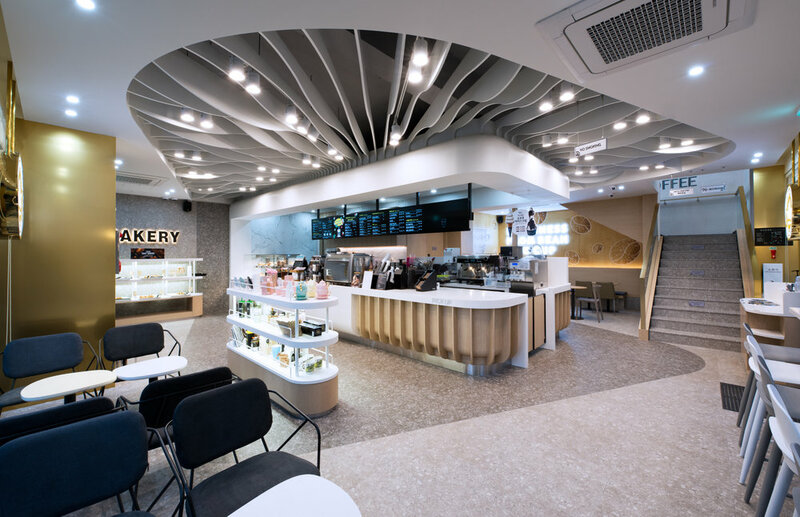 The outlet's ceiling is curvaceously shaped to create a sense of heavenly movement and energy whilst beams of light break through the heavenly sky, creating a comfortable and delightful atmosphere. 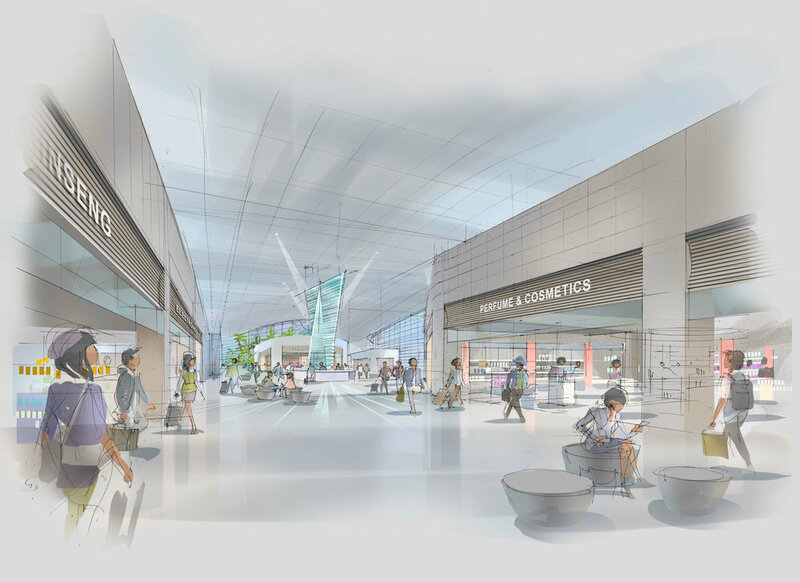 The new concept is being rolled out across Lotte GRS's retail estate throughout Asia, including branches at the recently opened Incheon Terminal 2. JHP’s on-going relationship with the Burger Lab has led to the opening of yet another iconic fast-dining experience. Located at the newly opened Terminal 2 at Incheon International Airport, the Burger Lab is not an ordinary fast food restaurant. All prepared to order right in front of the customer, it offers burger-lovers a finely tuned and limited menu, based on fresh, sustainable and well-sourced ingredients. Right on time for the Winter Olympics, JHP are delighted to announce our involvement in the newly opened Terminal 2 at Incheon International Airport. We cooperated with Lotte GRS on the terminal's dining experience, with Shinsegae Duty Free on its luxury stores and worked with the Airport Authority itself to develop its iconic landmarks. Stay tuned for more photographs! Q. When is a Shopping Centre Developer also a Retailer? A. When they open a store called ‘The Collection by Muse’. Located in APSYS' newly opened MUSE Shopping Centre in Metz, JHP have designed the ultimative incubator store. 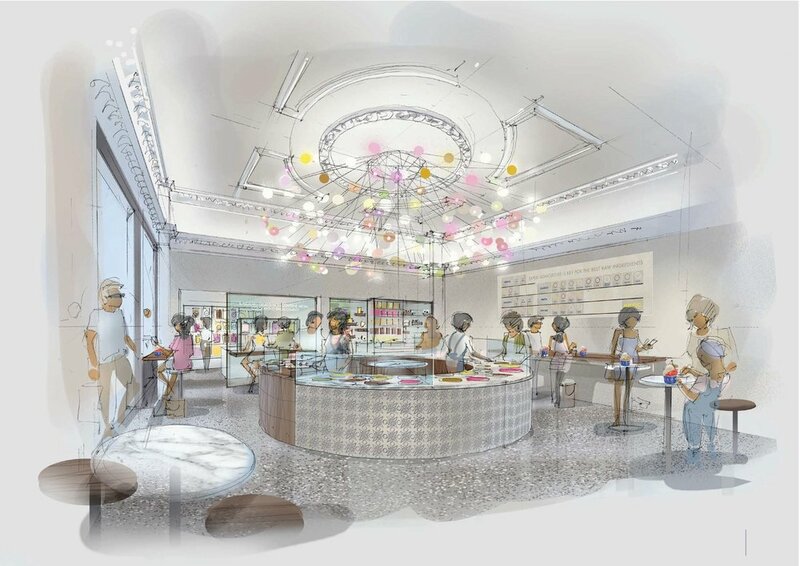 The Collection by Muse will host brands on a three month basis, ranging from Fashion, Accessories and Beauty to Home, Objects and Technology, with its current tenant being upcoming French fashion label ‘French Mode’. JHP are delighted to announce our involvement in the newly opened Terminal 2 at Incheon International Airport. Stay tuned for more details and photographs.